On their ninth studio album, pop-punk's reigning champs of sarcasm put it all aside (well, almost aside) to talk a little politics. 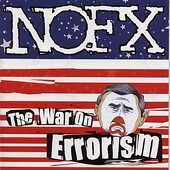 With a very anti-Bush tilt to the record, including a picture of a clown with Bush's face on it sporting the caption "somewhere in Texas there is a village without its idiot", The War On Errorism is NOFX's most political record. And, surprisingly enough, one of their best. Besides the lyrical expansion, the rest of the album is very NOFX, from the standard skate-punk that lines the album, through their diversion into ska. Fat Mike and company still make it fun, even when they're singing about the trickle down effect and corporate attitudes ("The Irrationality of Rationality"), complacency and ignorance ("Franco Un-American"), and modern day witch hunts ("Re-gaining Unconsciousness"). Tackling serious matters with a tongue-in-cheek perspective, you find yourself cracking up when you shouldn't be. Then the jokes hit you so hard you realize the impact of the words Fat Mike sings, and start to embrace rather than turning your back on the problem (another subject matter the band broaches on the album). However, for those fans that still want to be ignorant and stay blind, or for those that love NOFX's sense of humor and want to hear it without political commentary, NOFX delivers a few good-for-nothing, free-for-all laugh out loud pieces. Including "She's Nubs", a song about a fan with no arms or legs, and "Mattersville", a punk rock utopia for punkers that are over the hill. NOFX's songs may sound the same, they may not stray from their formula, but each new album brings us more inside jokes, more tongue-in-cheek puns, and more sly songs that poke fun at everyone from the listener to the band. Their latest, The War On Errorism expands and opens up the band's lyrical palette, but musically, it stays within their confines, while still sounding fresh and fun, something that should have dissipated and been none existent by the ninth album. But, somehow, NOFX is one of the very few to avoid that fate and keep rocking and making it fun. I'll give this an A-.